The family drama based on a true story will be swimming to Blu-ray and Blu-ray 3D in December! 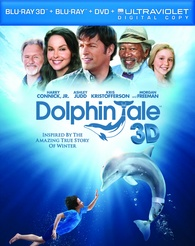 In an early announcement to retailers, Warner Brothers is preparing 'Dolphin Tale' Blu-ray/DVD/Digital Copy combo pack and 'Dolphin Tale - 3D' Blu-ray 3D/Blu-ray/DVD combo pack for a Blu-ray release on December 20. The releases will feature 1080p video, lossless soundtracks, and supplements will include: Ormie and the Cookie Jar, Deleted Scenes, Gag Reel, and Blu-ray exclusives include The Hutash Rainbow Bridge, At Home with Winter, Dolphin Tale: Spotlight on a Scene, Winter's Inspiration. You can find the latest specs for 'Dolphin Tale' and 'Dolphin Tale - 3D' linked from our Blu-ray Release Schedule, where they're both indexed under December 20.